Make yourself at home in one of the 12 air-conditioned rooms featuring minibars. Complimentary wireless Internet access is available to keep you connected. Bathrooms have bathtubs or showers and hair dryers. Conveniences include safes, and cribs/infant beds (complimentary) can be requested. 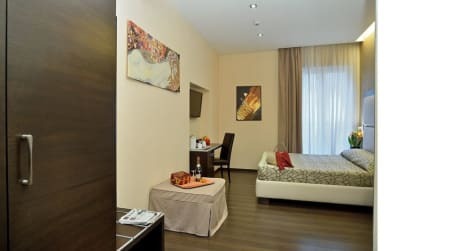 Make yourself at home in one of the 11 air-conditioned rooms featuring refrigerators and LCD televisions. Complimentary wireless Internet access is available to keep you connected. Bathrooms have complimentary toiletries and bidets. Conveniences include safes, and housekeeping is provided daily. Make yourself at home in one of the 9 air-conditioned rooms featuring minibars. Complimentary wireless Internet access keeps you connected, and satellite programming is available for your entertainment. Private bathrooms with showers feature designer toiletries and hair dryers. Conveniences include safes and desks, and housekeeping is provided daily. Featured amenities include express check-in, a 24-hour front desk, and luggage storage. A shuttle from the airport to the hotel is provided for a surcharge (available 24 hours).